The first comprehensive disability study for Tuvalu was conducted in February 2017 by field workers and research assistants including persons living with disabilities. One fieldworker was Mr Taupaka Uatea, the acting Office Manager of Fusi Alofa Association Tuvalu (a non-government organisation for people with disabilities). 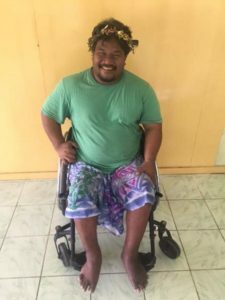 Mr Uatea not only gained skills in field research and data collection, but he also saw opportunities for Fusi Alofa to work more with disability and gender. Funded under the Australian aid program’s Pacific Women Shaping Pacific Development initiative, the survey collected information about the experiences of persons with disabilities and their carers. It examined physical, communication, attitudinal and institutional barriers they face in their everyday lives. My own disability was a barrier in the sense that I needed another fieldworker to support me moving around’, reflects Mr Uatea. Previously, there were just 72 people registered on Fusi Alofa’s database. The study, conducted in Funafuti and several outer islands, counted 466. The survey also collected specific data on the situation of women and girls living with disabilities. For Mr Uatea and the Fusi Alofa Association, this study is of the highest importance.